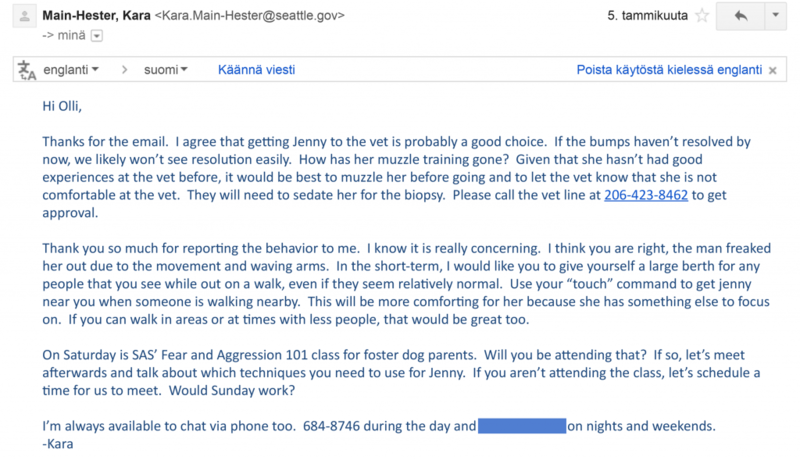 Why does Seattle Animal Shelter want to euthanize Jenny? Has Jenny been in a fight with another dog? What else is Jenny reactive to? What kind of training has Jenny received? Has anyone complained about Jenny’s behavior? Has Jenny’s behavior been evaluated by anyone other than SAS? What kind of dog is Jenny? Does Jenny have any health problems? Um, is Jenny a little chubby? Why haven’t you adopted Jenny before? 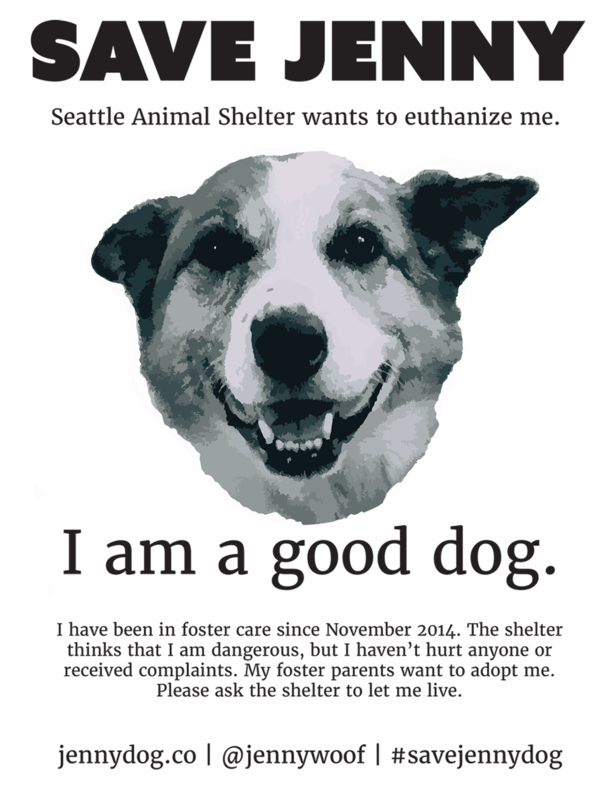 Seattle Animal Shelter (SAS) is responsible for public safety, enforcing Seattle’s Seattle Animal Codes, and for protecting the City from liability. SAS considers Jenny’s behavior to be unprovoked aggression towards humans. 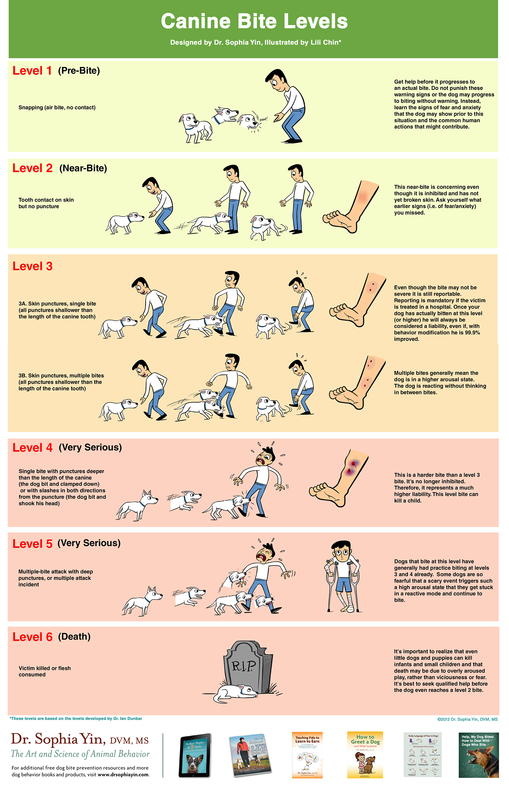 In her case, unprovoked aggression means air snapping and reactivity (barking, pulling/lunging on-leash). SAS has labeled Jenny dangerous because they claim that she has approached people in a menacing way, whether or not we (the witnesses) or they (the people who were air snapped) agree. Their knowledge of Jenny’s behavior came from our reports, not from any complaints or injuries. Because of the behavior described below, SAS considers Jenny an unacceptable liability. They fear that it’s only a matter of time before she hurts someone and the City gets sued. Jenny becomes nervous when people approach her suddenly and sometimes air snaps once to ask for more space. Very much like the dog in the Level 1 drawing above. Most of the air snapping incidents happened in the first few months that we had her. All, except two, happened in our apartment or building to people known to us (friends, neighbors, visitors) when they reached down to pet Jenny. We have good rapport with our SAS case managers and were completely open about Jenny’s behavior. The shelter seemed understanding about Jenny’s issues and at no point were we notified that Jenny was in danger of being euthanized. We were told from the beginning that Jenny was ‘sensitive’ to being touched. Jenny air snapped to warn, people gave her space, and all was well. She never made any aggressive gestures after the initial snap. Most of the time, the snaps made no contact, but there were a few incidents with light teeth touches. No injuries, no broken skin, no complaints, and many of the same people can now pet Jenny with no problem. Note: We found out in April that she had three broken teeth. No wonder she didn’t want people to touch her face. Obnoxious or aggressive behavior but no skin contact by teeth. Skin contact by teeth but no skin puncture. However, may be skin nicks (less than one tenth of an inch deep) and slight bleeding caused by forward or lateral movement of teeth against skin, but no vertical punctures. Jenny has air snapped strangers twice outside our building, both times with contact to fabric. Kara, our case manager, visited soon after and spent an hour showing us ways to manage Jenny’s reactivity. For air snapping, she suggested that we tell people, “Jenny’s more comfortable if you put your hands in your pocket.” We started telling people more firmly not to touch Jenny right away and the incidents pretty much stopped. A woman passed us (Amie and Jenny) on a narrow trail. Her skirt whooshed by Jenny’s head. Jenny turn her head and air snapped, catching the fabric for a brief moment. The woman with the skirt was not injured or scared, although I recognize that she could have been. We stopped on the trail, I apologized, Jenny showed no signs of aggression, and the woman said kindly, You’re still learning, aren’t you? and walked away. The trail that Jenny and I were on is usually empty. Occasionally when there are runners or strollers, we walk in the street or stop and wait for them to pass. This situation (Jenny and me walking alone on a narrow trail with a person passing closely next to her) was new and I didn’t manage it properly. We now suspect that Jenny has problems with her vision and might not have seen the woman until she was very close. I reported the incident to SAS and the next day we were told that she is no longer an adoption candidate and should be euthanized within one week. Jenny goes out four times a day, so over the past eight months, we’ve been outside our building with her over 900 times. We’ve had two air snapping incidents with strangers, one for each of us — 0.2% of the time. 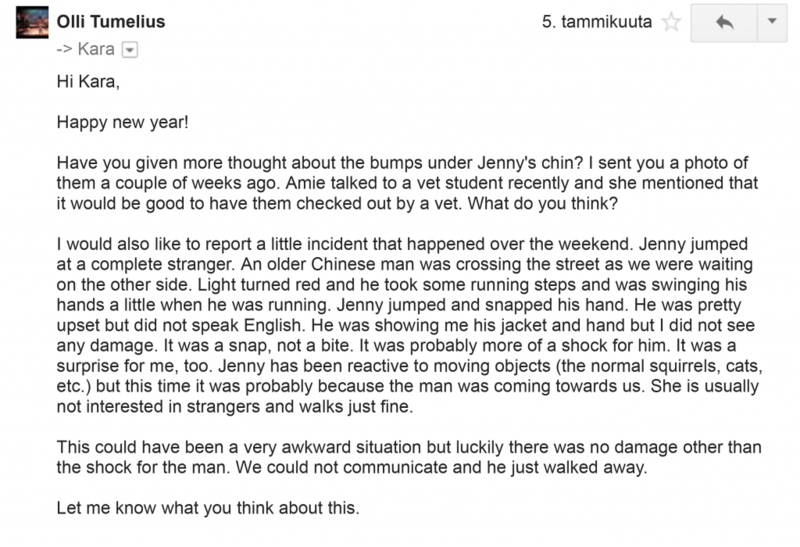 After Olli’s incident, he always keeps Jenny on short leash and puts himself between Jenny and people passing closely. I do the same now and the skirt incident will not be repeated. We would not put Jenny in the position to be startled or scared like that again. We learned from our mistakes. We should have managed Jenny’s fear of strangers touching her earlier. We were air snapped several times in the first week as we learned her boundaries. We told everyone we met to be careful because Jenny is sensitive. Some people still touched her and was air snapped. When Kara visited in January and suggested we be more specific, we started telling new people not to touch her and the air snapping stopped. 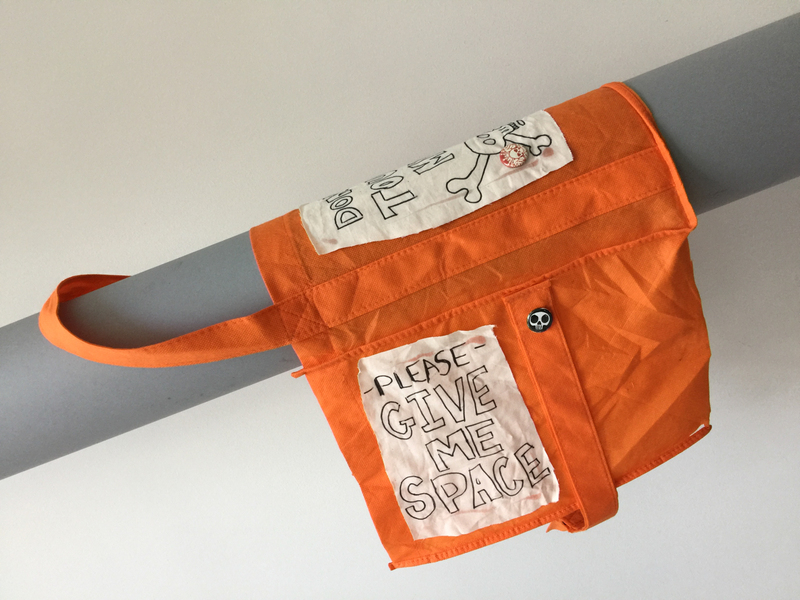 Recently we visited Judith Anderson-Wright and she suggested a ‘give me space’ vest to create a self-warning dog. Something we hadn’t known about before. We are open to other suggestions from trainers and behaviorists about how to keep Jenny and the people around her safe. No physical fights, just shouting matches. Jenny is reactive to some dogs, especially if they are also nervous and reactive. She barks, growls, and pulls towards them, but is fairly easy to manage and redirect. We’ve been on high-traffic trails such as Mount Si and Discovery Park and she’s been fine. Since being with us, Jenny hasn’t had a chance to meet another dog off-leash in a neutral environment. Jenny gets startled by fireworks and shooting, which, unfortunately, we hear every couple of weeks. Our case managers told us that every dog parent is different and that some like to train more than others. We mostly spend time with Jenny in a less structured way. We love having outdoor adventures and hanging out in the garden together. We are out with Jenny for approximately two hours every day. Olli works at home, so she’s rarely at home alone for more than four hours. She receives plenty of love, interaction, and socialization. Jenny became habituated to our environment and no longer reacts to metro buses and other things that used to bother her. She also warms up to people much faster. Last November when we picked her up from the shelter, it took us a few weeks to gain her trust. In May, when she spent a week with brand new SAS foster parents, it only took her a few days. Note: Miah, an inexperienced dog handler found her difficult at first, but Mike, an experienced dog handler had no problems with Jenny. We worked on desensitizing her body handling issues and muzzle training her for visits to the vet. When she came to us, no one could put a harness on her or touch her paws or belly, she would growl and snap. Now we can put on a vest or harness and touch her anywhere without any problems. Jenny is reactive under very specific, manageable circumstances. With training, she would be more comfortable around other dogs and less sensitive to triggers such as skateboards and motorcycles. SAS recommended and would have paid for classes like Reactive Rover, Fear and Aggression 101, and Difficult Dog. We regret not taking them up on it. If we knew that SAS would—without warning—shift from calling Jenny, ‘sensitive’ and ‘reactive’ to ‘aggressive’ and dangerous’ — we would have taken her to formal training. However, training might not have prevented the two stranger air snapping incidents which are the greatest public safety concern to SAS. Those could have been prevented with experience, which we now have. Learned the hard way. Overall, we think that Jenny’s behavior and mood has improved since being with us. She is more curious, friendly, and affectionate towards people, especially those she sees regularly. If we can adopt her, we will dedicate time and resources to training. The veterinarian who treated Jenny said that she was very aggressive towards her staff and was impossible to treat without sedation. SAS told us that going to the vet is a high-stress situation and should not be used to gauge an animal’s normal level of aggression. After the decision was made to euthanize Jenny, we asked if we can get an outside evaluation by a animal behaviorist or dog trainer or have someone at SAS live with her for a week or two. SAS was not interested in Jenny’s current behavior or her potential for change through training. They are only concerned with her known behavior (air snapping/reactivity). Because they interpret this behavior as dangerous and unprovoked aggression towards humans, they no longer think that she can be adopted out without significant and unacceptable liability to the City. We do not interpret Jenny’s behavior as dangerous or aggressive. We hope that by collecting statements of Jenny’s observed behavior from community and animal professionals, we can clear up this misunderstanding with SAS and alleviate their concerns about public safety and liability. June 24, 2015 – Report by Judith Anderson-Wright, M.A. We think that Jenny is a long-legged Corgi, a small-headed Akita, a super fluffy Cattle Dog, a giant Norrbottenspets, or possibly a mutant cat. She’s estimated to be 7–8 years old. An elderly lady. Cat-like. Clean, quiet, aloof, independent, naps all day, chases flies around the house. Watchful. Gentle and sweet. Occasionally sighs and looks at you with contempt. Old soul. In April, Jenny had a benign fatty mass under her chin, two fractured carnassial teeth, and one molar removed. The broken teeth might have been the reason she air snapped people who touched her face. Blood work done at that time showed no problems. Jenny has arthritis in her hip-area. Sometimes she has a hard time getting up up from the floor or laying down. She also does not like it when we brush or touch her in that area. We also think she might have problems with her vision. Her eyes look a little cloudy and maybe she has trouble judging distance. She is much more wary when we go on walks in the dark. Depends on the angle. Yes, when she sleeps on her side. Yes, when she is running. Yes, when she goes down the stairs. No, if you’re towering above her and she sits straight up for treats. Why do you ask??? What are Jenny favorite foods? Because we had no other options if we wanted Jenny to live. Last summer, we returned from a 3-year bicycle journey across Europe and Asia. It was hard transitioning back to life at home. Since we did not know where we’d land, we didn’t feel ready to commit to a forever dog. But, we love animals and wanted to help foster. Jenny caught our eye when we first visited SAS in October. We entered the Foster Parent Program specifically for her — she wasn’t even on the foster list. We took her home with the understanding that we would find a perfect family for her. We live in a one-bedroom apartment in a dense urban area and imagined that Jenny would be happiest in a house with a yard. Life with Jenny has it’s ups and downs, like all relationships. She’s easy to live with 99% of the time. She can be reactive and grumpy and once in a while we’d fantasize about having an easier and more affectionate dog. Sometimes we grouched about her to our case managers, like you would complain about a family member or anyone that you see too much of. During the past eight months, we were working under the assumption that we were Jenny’s temporary home and our responsibilities were to care for her and to help SAS find her a forever home. When we asked for a foster transfer, it was after a long period of not receiving any adoption applications for Jenny. We wanted to nudge SAS to promote Jenny, including cross-posting her on other sites. At that time, we had both been working a lot and Amie was recovering from a bout of depression. Asking for a foster transfer had nothing to do with Jenny’s behavior and everything to do with needing a break in general. If we were Jenny’s adoptive parents, we would have had a different set of expectations and a different set of strategies to deal with stress and burn-out. Although we had to make a decision quickly, asking to adopt Jenny now is not a knee-jerk reaction made solely to save her life. 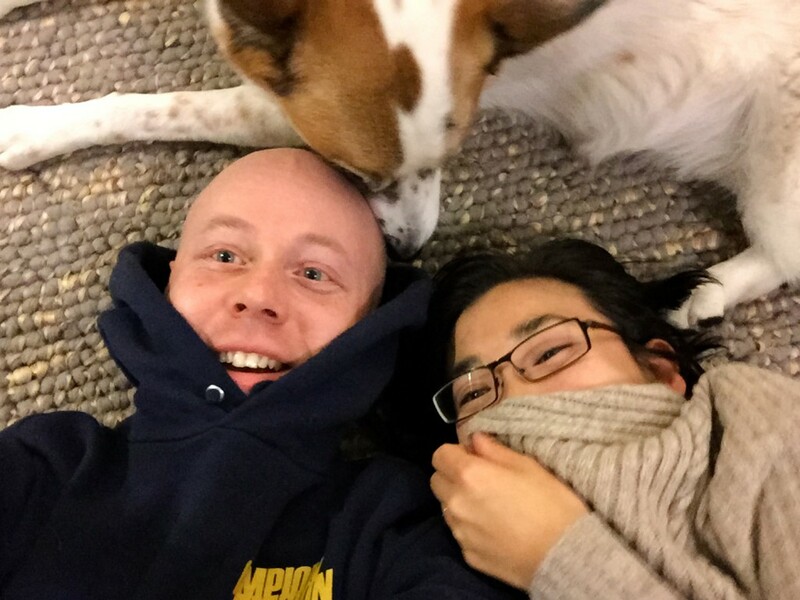 Almost losing Jenny (and working so hard to try to save her) made us realize that the dog we have is the one we love and we’d like to make her a permanent part of our family and community. Jenny and her silly humans.